Image courtesy of Leland Francisco at FreeDigitalPhotos.net. I have lived by mantras for almost twenty years now, after my dear sister-friend Glenna took me under her wing and taught me how powerful they could be. Since then I’ve always had a primary mantra that I’ve made a part of each day, serving as a reminder for what I wanted to manifest in my life. At the Chopra Center for Meditation website, a mantra is described as having two parts: man, which is the root of the Sanskrit word for mind; and tra, which is the root of the word instrument. An instrument of the mind… for the mind. Who couldn’t benefit from that? Interestingly (though not surprising), as I evolve spiritually so do my mantras. Looking back I can easily see how past mantras reflect where I was in life. The “instrument of the mind” perfectly tuned to my needs and desires at various stages in my personal and spiritual evolution. My first primary mantra, and one I kept for many years, was a simple word: Success. This one word had many levels of meaning. I embraced it at a time when I was going through a hostile separation, divorce, and custody battle. At the same time, I was beginning a new career in a new industry. I was starting a new life in a new place, with no extended family to support me. I was making new friends. I was redefining the woman I was to become. I wrote my focus word on little pieces of paper and tucked them into pockets, taped them onto the computer, and made them part of my password system. This one word was a simple reminder of all I desired at the time. Every day I read the word whenever I saw one of my notes or had to type it to unlock my computer. Each time I would repeat it silently and feel it become a part of me. Needless to say, my mantra brought me all that I desired. It gave me the success I sought in my family life, career, and social circles. Then one day I began to feel as though I had outgrown it, that perhaps it was too materialistic. So I shifted my primary mantra to another inspiring single word: Gratitude. Behind that word was one of my favorite phrases: An attitude of gratitude. I observed that people I knew who always complained, always seemed to manifest more to complain about. By contrast, I realized how quickly my life shifted when I practiced feelings of gratitude for even the smallest things. The more gratitude I practiced, the more I had to be grateful for! Again my mantra of gratitude became core to my daily work and personal practice. Each time I recited it, I would pause to consider: what am I grateful for in this moment? And there was always so much to appreciate! 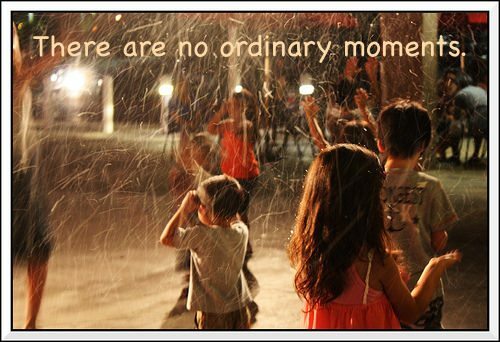 Now I’m in a new place of spiritual development and growth and hence a new mantra for daily living has emerged: There are no ordinary moments. Every. Moment. Is. Special. All by itself. When I consider this beautiful truth, my heart feels lighter. I feel a warmth flowing through my body. My face relaxes and my lips curl into a soft smile. My inner wisdom reveals herself. I didn’t pick this mantra, it picked me. In the recent process of relocating my office, I’ve been going through lots of papers. 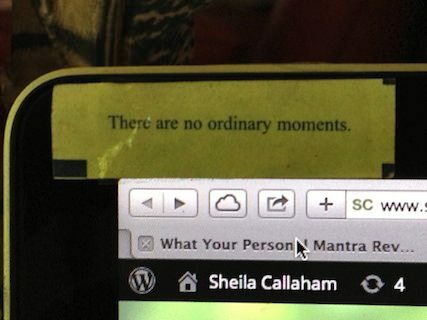 And there it was — a note I had saved from a fortune cookie with the words There are no ordinary moments. When I read it, I felt a new awakening. Instead of tossing it in the trash bin, I taped it to the top of my computer screen. 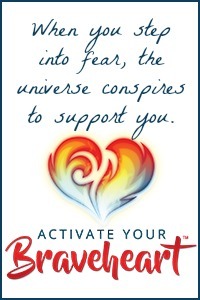 The words resonated so strongly with me that I knew instantly my mantra had just been revised. Each day as I work, my eyes eagerly reach for the wise words. When I read them, they echo in my mind, in my heart, and in my soul. There are no ordinary moments because I have the choice to recognize the beauty and mystery in every second of every minute of every hour of every day. “Ditto, until infinity!” as my youngest son would say. Ahhh, I can’t imagine how life can get any richer than this! If you have a personal mantra what does it reveal about you? If you’re considering a mantra, you’ll find lots of examples on this wiki page.